My best friend ikes to tease me about my craze for words and my OED obsession. If I was late to meet her when we were in college, she could usually find me in the library, lost in a volume of the Oxford English Dictionary. The Oxford English Dictionary is one of the most extraordinary creations of the human intellect. (Can you tell I'm a bit biased, yet?) It isn't the first dictionary of English ever, but it certainly has a fascinating history. Besides giving a definition for each word, the dictionary tried to be a resource for scholars and academics, by tracing the usage of words to their earliest occurrence in print or writings. 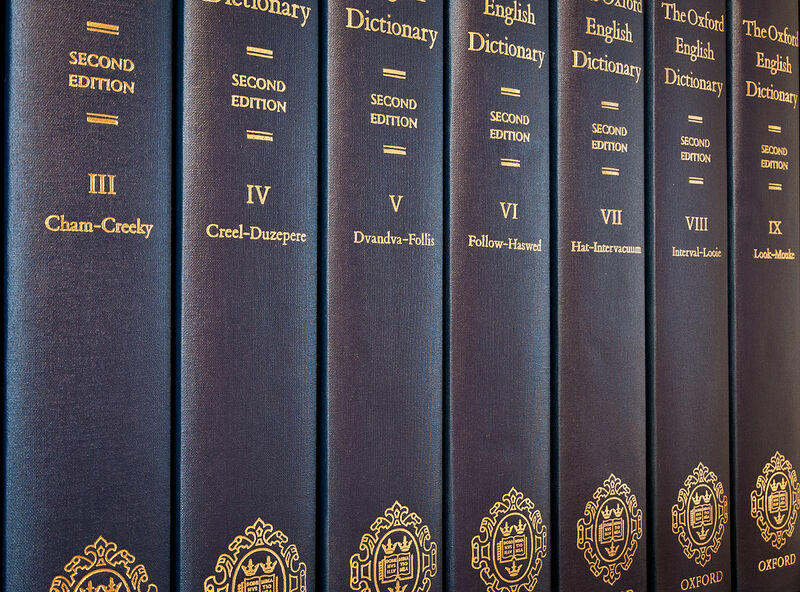 The first ten-volume set of the dictionary was published in 1928. Work had begun in 1857. That's seventy-one years, to document the usage and history of words. It took another sixty-one years for the second edition to come out in 1989, coming in this time at 20 volumes. The OED may have been one of the earliest examples of crowdsourcing: The editors appealed to readers by placing ads in newspapers, asking them to send in quotations that could be used as examples for the usage of words. In fact, some of the readers who contributed the most were pretty colorful characters themselves. The Professor and the Madman, by Simon Winchester, is the story of William Chester Minor, an American military physician who contributed vast amounts of material to the dictionary. It took the OED editors years to discover the man was confined to an institution for the criminally insane. Fantasy author J.R.R. Tolkien worked as a researcher for the OED from 1919 to 20, working on, what else, the W volume, Waggle to Warlock. My riff today on the OED is due to its announcement this week of its "Word of the Year." Here's why. When I was a child, I read the Newbery-Award winning novel Johnny Tremain (one of my favorites! ), about pre-Revolutionary Boston, and was struck by the description of the signs above the stores in Boston. They were images that illustrated the merchants' trades, since most of the 1770s population did not know how to read. I was awestruck at that. Look how far we've come, I thought, imagining in my childhood innocence, that, of course, by now, everyone knew how to read. That was a very good thing, I said, because I loved words. I think I sensed, even then, that there are so many nuances to human emotions, so many shades of human experience, there can never be too many words to describe them all to each other precisely. I've learned better by now -- literacy is still a major challenge even, to our shame, in countries like the United States. What are we to say when national tests show only thirty-two percent of eighth-graders read proficiently? In my Christmas novella, "Sweet Blizzard," the heroine plans to set up a new literacy program for underprivileged children. Certainly, way too many people are still waiting for the gift of reading. When I saw my beloved OED's choice for Word of the Year, I was so shocked that I wondered if we hadn't been sucked back in a time warp to the days when merchants had to rely on images because people couldn't read. I wanted to cry. Previous Word-of-the-Year winners have included the words locavore, refudiate, vape. This year's winner isn't even a word. We need more stories. More and more and more good stories to make people want to spend more time reading - rather than quickly eyeing or sending emojis back and forth! What do you think about the Word of the Year? A welcome bit of humor or a sad sign of the times? You can find her on her website, www.miloukoenings.com, on Facebook, Twitter or Pinterest. 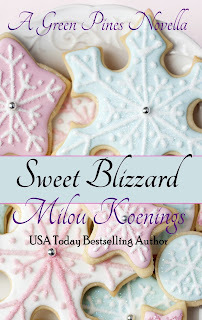 Her newest novella, Sweet Blizzard, is included in Sweet Christmas Kisses 2, a USA Today bestselling anthology of 19 sweet Christmas novellas by award-winning authors. Milou, thanks for the info. A very interesting post.